‘SPOT’ Platinum 5″ LCD twin port digital monitor. – ROHS and E13 certificated. It produces a fantastic picture quality, has full mirror function and reverse trigger. It is 10-37 Volts and requires no control box, simply plugging directly into the camera with heavy duty screw plugs. It comes with a swivel / tilt mounting bracket and detachable sun visor. A state of the art ‘sony’ CCD Colour Day/night Camera. It produces a crisp colour image during daylight and a clear black and white image during 0 lux total darkness (up to 10m) by automatically switching to its 18 Infra red LED’s. This is sold as a 1 camera system but an additional camera can be added to the system easily. 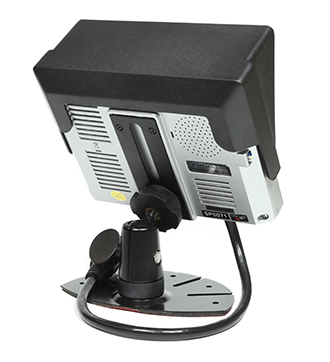 The monitor has a switch feature making it ideal for multi camera applications. Waterproof up to IP68, shockproof up to 10G and has a wide angle lens. This monitor also has audio which people have requested for on site work. The camera plugs directly into the supplied 20m main wiring loom and comes with mounting bracket. It is very simple to install and comes with all necessary wiring included. 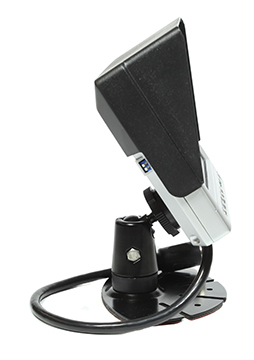 No control box camera simply plug directly into the monitor.